The name means ‘Old Barn’. In 1759 David Richard, mason, lived here. In 1779 it was part of the former Plas Newydd estate offered for sale by the Noyadd Trefawr estate. In 1781 Evan John of Sgyborhen became a Church Warden. In 1782 probate was made of the will of David Richard of Scyborhen. He referred to his sons: William; John; Benjamin; and David Richard; daughter Elizabeth Richard (to whom he left a house in St. Dogmaels); and his wife Anne Richard. In 1785 William Richards of Ysgyborhen became a Constable. In 1786-1803 Thomas Morris leased Ysgyborhen to William Richards. In 1787-1804 David Richard lived here. In 1795 William Richard of Sgyborhen became a Church Warden. On 1st May 1795 Frances Gwynne leased the property to John Thomas, farmer, for £4.13s.6d. per annum, including Park Berllan Fawr. On 9th April 1822 William Richards, son of William & Elizabeth Richards of this address, emigrated to the Cardigan Settlement at St. John’s, New Brunswick, Canada, on board the “Active” of Cardigan. In 1827-71 Benjamin Richards lived here. In 1827 William Richards, Benjamin Richards, Thomas Richards and John Richards of this address were shareholders in the 93 ton ship ‘Margaret’. In 1828 Benjamin Richards owned shares in the 61 ton ship ‘Gratitude’. On 22nd July 1834 Elizabeth Richards, wife of William Richards of Ysgyborhen, died aged 81. In 1834-53 Benjamin Richard was the tenant here of David Davies of Bridge House, Cardigan and Castle Green (Cardigan Castle). On 17th February 1836 William Richards of Ysgyborhen died aged 97. In 1836 Benjamin Richards, Thomas Richards and John Richards of this address all owned shares in the 73 ton Cardigan ship ‘Margaret’. In 1837 Benjamin Richards owned shares in the 31 ton Cardigan ship ‘Ann’. On 26th September 1837 John Richards of this address married Mary Williams, daughter of W. Williams of Pantygrwndy, Llantood. In 1838 the property is marked as Waungarreg on the Tithe Map. In 1841-1914 William Richards lived here. In 1841 John Richards of Scyborhen purchased Pencwm. In 1841 the following persons lived here: Benjamin Richards, 35; Mary Richards, 25, his wife; Margaret Richards, 4, their daughter; Eliza Richards, 1, daughter; William Richards, 3 months, son; and servants – Elizabeth Bowen, 20; and Mary Jones, 9. On 27th April 1843 David Nicholas, labourer at this address, married Margaret Davies of Mill Street, St. Dogmaels. On 28th February 1844 Mary Ann Richards, daughter of Benjamin & Mary Richards, died aged 3. On 6th March 1844 Benjamin and Mary Richards lost two children – Benjamin Richards aged 1 year and 9 months and Margaret Richards aged 7. On 21st December 1847 Benjamin Thomas, labourer at this address, married Margaret Griffith of St. Dogmaels. In 1851 a separate dwelling here was the home of Evan Davies, 62; Elizabeth Davies, 59; and Evan Davies, 12. 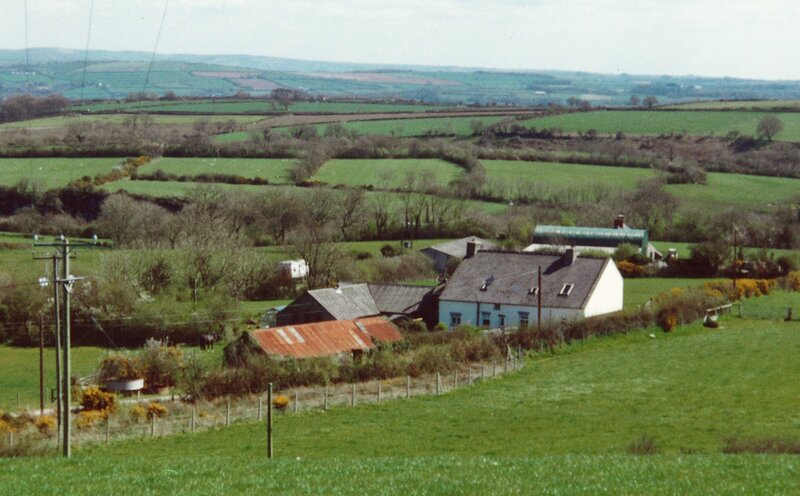 The following persons lived at Ysgyborhen itself: Benjamin Richards, 42, farmer of 38 acres; Mary Richards, 39, his wife; Eliza Richards, 11, their daughter; Mary Richards, 6, daughter; William Richards, 5, son; Dinah Richards, 8; Phoebe Richards, 8; John Richards, 5 months; and two servants. In 1854-69 James Jones, carter, of this address, was a tenant of the Castle Green (Cardigan Castle) estate. In 1871 the following persons lived here: Benjamin Richards, 67, farmer of 36 acres; Mary Richards, 58, his wife; Mary Ann Richards, 25, their daughter, quilt-maker; William Richards, 36, son; Dinah Richards, 22, daughter; Phoebe Richards, 20, daughter; John Richards, 18, cabinet-maker; and Benjamin Richards, 16, son. On 30th September 1880 Dinah Richards, daughter of Benjamin and Mary Richards, died aged 31. In 1881 the following persons lived here: Benjamin Richards, 77, farming 45 acres; Mary Richards, 66, his wife; Mary Annn Richards, 32, their daughter, dairymaid; William Richards, 31, son, farm labourer; John Richards, 28, son, carpenter; Phoebe Richards, 23, daughter, general servant; and Morris Morgan, 12, farm servant. On 10th February 1882 Benjamin Richards died aged 78. In the late 1880’s the property was occupied by Mary Richards, William Richards, John Richards, Phoebe Richards and Mary Ann Richards. 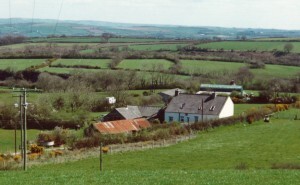 Mary Thomas lived at Hen Scyborhen. On 27th January 1890 Mary Richards, widow of Benjamin Richards, died aged 90. In 1891 the following persons lived here: William Richards, 41, farmer; Mary Anne Richards, 40, his sister; John Richards, 36, his brother; Phoebe Richards, 34, his sister; and William Davies, 15, servant. On 26th September 1893 John Jones of Trelech-a’r-Bettws married Miss Mary Ann Richards of Ysgyborhen. In 1897 Mary Jones of this address received assistance from the Cardigan Union. On 5th October 1899 James Davies of Scyborhen married Miss Mary Hannah Thomas of Pantygrwndyfach. In 1901 the following persons lived here: William Richards, 48, farmer, Welsh-speaking; John Richards, 40, his brother, carpenter, Welsh-speaking; Phoebe Richards, 38, sister, bilingual; and Ellen Gwynne, 20, servant, bilingual. All were born in the parish. On 26th December 1901 William Richards of Ysgyborhen married Miss Martha Ladd of Trewidwal. On 29th May 1905 John Richards of Ysgyborhen, died aged 54. On 3rd June 1909 Miss Mary Hannah Davies of Ysgyborhen married Abraham Finch of Graig, Mwnt. On 30th January 1913 Phoebe Richards, daughter of the late Benjamin & Mary Richards, died aged 62. On 7th October 1915 there was a clear-out sale here for William Richards. On 27th January 1917 William Richards of Ysgyborhen died aged 70. On 5th June 1919 Martha Richards, widow of William Richards, died aged 65. On 5th February 1921 David John Ladd of Ysgyborhen died aged 41. On 23rd August 1925 Lizzie Davies, wife of James Davies of Ysgyborhen, died aged 57. In 1926-44 James Davies was the farmer. In 1930 David Ladd Davies of Ysgyborhen became a Deacon of Blaenwaun Baptist Chapel and remained so in 1944. On May 23rd 1931 William Thomas Jenkins of this address was buried at St. Dogmaels having died aged 61. On 21st January 1936 David Ladd Davies, youngest son of James Davies and the late Mrs. Davies, married Gwenever Orlinda Davies of Nevern. In 1938-39 James Davies, Mary Davies, Elizabeth Davies and Sarah Davies lived here. In 1944 James Davies, Mary A. Davies, Elizabeth Davies, Sarah J. Trail and Anthony Trail lived here. On 2nd June 1946 Miss Elizabeth Davies, daughter of James Davies of this address, died aged 51. On 11th September 1946 James Davies died aged 81. In March 1960 Mrs. Sarah Jane Trail of this address died, leaving a husband – Anthony L. Trail. In November 1965 Miss Mary Anne Davies of this address died aged 72 at Pencnwc – her brother’s home. In September 2007 the property was advertised for sale. In 2011 the property was advertised for sale again. C19 house in uncoursed rubble with slate roof and ridge stack. Two storey frontage with outshut rear. Monumental Inscriptions, Blaenywaun Chapel cemetery. © Glen K Johnson 22/09/2013.